Portable, Lightweight and Compact . Weighing less than 9 oz. 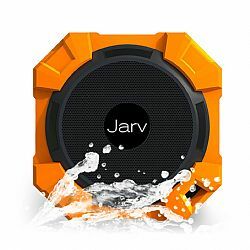 Jarv X96 Water proof Bluetooth speaker is perfect for use indoors and out! Water Proof (IPX5 rated) perfect for use at home pool side, in the bathroom or shower or on the go! Backpacking, cycling or just sitting on the beach. Rugged, Water Proof, Dust Proof, Compact and lightweight! Dust and shock proof the Jarv X96 Rugged speaker is able to withstand drops from up to 6ft high and function in humid, dust filled environments with a hitch!